I like the gloves. Much better than those cheap looking cotton armcovers..
You can also try ebay for 'fingerless gloves' some of them are quite trendy, funky, what have you and you 'young ones' could probably create great outfits with them/around them. A lot of them go up to the elbow so they are great as arm covers. I got my daughter a beautiful set of a dozen arm covers with colors and prints that you can't find at the hijab stores. If you're in the U.S. I suggest you try Target at holiday season..last winter they had GORGEOUS teal faux leather gloves with about 6 rhinestone buttons at the wrist. I shoulda bought them but my pre-teen daughter rolled her eyes and asked where I would wear them! 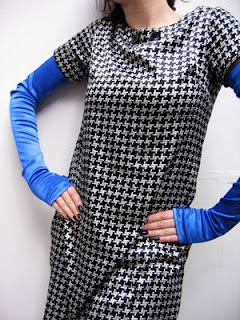 I don't know why, but I keep thinking that the houndstooth dress would look nice in an ankle-length. With the blue gloves. And maybe a belt. And a clutch. Fatima, that's great! I'm glad I could help, let us know how they turn out! those gloves are so cool! i think i want to try some funky t-shirts with funky arm sleeves as well-- what do u think? like a cool colored "go green" tee with black and white striped arm sleeves...could u do a post on how to look "funky" without being a "flunky" ? LOL.. thanks!